“My life has turned all topsy turvy and what I’ve gone through only I know,” says 42-year old Tahira, mother of two and wife of the late Dr Abid Iqbal Zaidi, a renowned cardiologist in Quetta. Tahira’s voice is strained as she struggles to keep herself composed. Exactly two years back, on August 17, 2009, after saying his evening prayers, the 49-year old doctor left, as was his routine, to go to his private clinic located on Fatima Jinnah Road when he was gunned down. Within half an hour, Tahira got the news. “The systematic elimination of between 400 to 500 Hazaras with over 1,500 having been maimed for life means our people cannot even go to the market to buy groceries. Attending funerals every day is a norm now,” said Khaliq, chairperson of the Hazara Democratic Party. The party’s former chairman was assassinated in 2008 by the LeJ. Hazaras had fled to Quetta from Afghanistan some 120 years ago, due to atrocities committed against them there. Today the fourth generation considers Pakistan as its home, explains Irfan Ali, a member of the Quetta-based Human Rights Commission for Social Justice and Peace. The population of Hazaras in Pakistan is around 956,000 of which between 500,000 to 600,000 live in Quetta alone. According to Khaliq, if one compares the killings of Hazaras in Quetta to the recent spate of killing in Karachi, it is “eight or ten-fold higher in Quetta, in proportion to the population of both the cities”. Yet it has failed to move the media or those in seats of power. “The terrorists have links with the Tehrik-i-Taliban Pakistan and Afghanistan, and thus, with the Al Qaeda,” said Khaliq, adding, “and are given complete protection by the state and its intelligence agencies”. Parliamentarians, law enforcement agencies and top leaders in the government have said ‘their hands are tied’. Irfan Ali believes there to be a political motive behind this ethnic cleansing where religion is used as a tool. He observed that anti-Shia militants may have links with the Jundullah (also known as the People’s Resistance Movement of Iran), fighting for the rights of the Sunni Muslims in Iran. “They think Hazaras are pro-Iran and supported by the Iranian government and fear that if they don’t eliminate us here, Pakistan may become a Shia state influenced by Iran,” points out Ali. 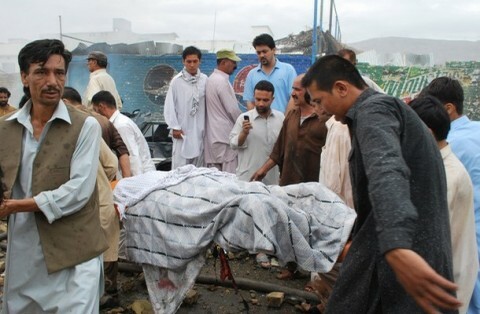 In the past five years or so, Amjad Hussain, a Hazara, working for a TV channel, has seen young Hazaras fleeing Quetta. “Many have already fled or are trying to leave, legally or illegally. Australia is their preferred destination,” Hussain told Dawn.